Not so long ago, I wrote a small OS prototype for the Cortex-A8 CPU. I was using qemu but now I wanted to play with a real device. So I decided to give it a shot with my BeagleBone Black. The beaglebone black's AM3359 chip has an internal ROM (located at 0x40000000) that contains boot code. That boot code will attempt to boot from many sources but I am only interested in the eMMC booting. The boot code will expect the eMMC to be partitioned and that the first partition is FAT32. I don't know if there is anyway to just use the eMMC as raw memory and have the AM3359 boot code to just load whatever is at the bottom of the flash without any partitions, so I will live with the FAT32 concept. I want to use u-boot because I want to be able to update my kernel with tftp. The stock BBB will have the eMMC formatted with a FAT32 partition with uboot on it. I will make a u-boot script that downloads my kernel from the tftp server, copy it in flash memory and then have u-boot load that kernel from flash memory into RAM. That last step is not necessary but I want to do it because at a later point in time, I will remove the tftp part from the u-boot script and only have the kernel in flash be loaded in RAM. The proper way to do this, would be to store the kernel file and all of my application files in the ext2 partition that is already present in the eMMC. But then, I would need a EXT2 driver in my kernel so that it could load the application files from the flash. I don't wanna bother writing a ext2 driver for now so I will hack my way though this instead. So instead of getting uboot to download the kernel and applications in a eMMC partition, I will get it to write the kernel at a fixed location (0x04000000) in the eMMC. This will most probably overwrite a part of the 1st or second partition but I really don't care at that point. As long as I don't overwrite the partition table and the begining of the FAT32 partition where u-boot sits. Then all applications will be written one after the other just after the kernel in a linked-list style. According to section 2.1 of the TI reference manual for the AM335x, the ROM starts at 0x40000000. But then, in section 26.1.3.1, they say that the ROM starts at 0x20000. This is very confusing. It turns out that when booting, memory location 0x40000000 is aliased to 0x00000000. The CPU starts executing there, and some ROM code jumps to the "public ROM code". The public ROM code starts at ROM_BASE+0x20000. Since memory is aliased, 0x200000 is the same as 0x40020000. Section 26.1.4.2 says that the ROM code relocates the interrupt vector to 0x200000, probably using CP15 register c12. When the ROM code finds the x-loader (MLO) in flash memory, it loads it in SRAM at 0x402F0400. At this point, system behavior is defined by u-boot (MLO was built with u-boot). What was confusing me at first was that I thought that the eMMC mapped to 0x00000000. Turns out that this memory is not directly addressable. So if I need to retrieve my applications from eMMC, I will need to write a eMMC driver because the eMMC is only accessible through EMMC1. Now that I understand how eMMC works, I realize that it was foolish of me to think that it could be directly addressable. The MMC1 peripheral will allow you to communicate with the on-board eMMC but you still need to write your own code to interface it using the SD/MMC protocol. I had a really hard time finding information on how to read the eMMC. The TI documentation is good at explaining how to use the MMC controller but they don't explain how to actually communicate with the eMMC. And that's normal since the eMMC is board dependant. The eMMC is accessible through MMC1. The TI documentation explains how to initialize the device but since we know that the board contains eMMC, we don't have to go through all the trouble of detecting card types etc. I was really surprised of how it was hard to find good documentation on how to use the MMC/SD protocol. I can't really explain what I did, all I know is that it works, and the code will definitely not be portable to another board. I read the TRM and also looked at another source code and trought trial and error, I was able to read the eMMC. The file emmc.S in my source code is pretty easy to understand. I was not able to send the proper command to set the device in "block addressing mode" and to change the bus width. Like I said, this information is kinda hard to find. I'll have to do a lot more researching to make this work. I want uboot to download my kernel from tftp and load it in memory. There doesn't seem to be any easy way to do this. I couldn't find a way to install uboot on my BBB without installing a full eMMC image containing linux. So I decided to just use the stock eMMC image but modify uboot to boot my kernel instead of the installed linux. But it seems that changing the environment variable "bootcmd" is impossible from uboot on the BBB. But there is the uenv.txt file residing on the FAT partition that I can change to contain my own script to download my kernel. Well, that to is impossible to modify directly from uboot. The software IRQs on the BBB work in a completely different way than the realview-pb-8 board. On the BBB, software IRQs are not dedicated IRQs. You get a register that allows you to trigger an IRQ that is tied to a hardware IRQ already. So You can only use software IRQ to fake a hardware IRQ. This means that you could send a software IRQ 95 but that would be the same as if you would get a timer7 IRQ. You actually need to unmask IRQ 95 for this to work, but unmasking IRQ 95 will also allow you to get TIMER7 IRQs. In my case, this is excellent. Because my timer7 IRQ calls my scheduler code. So a Yield() function would just trigger that IRQ artificially using the software IRQ register. User-mode threads can register interrupt handlers in order to be notified when GPIO is triggered. The way this works is that whenever an interrupt is received, if a user-handler is defined, then the page table is changed to the page table base address of the thread that is interested in receiving the event. Then, a jump to the handler is done. So the CPU stays in IRQ mode, but the page table is changed and the user-mode handler is executed in IRQ mode. sending data on more than one UART. I've always wondered how programming for an ARM cpu is. So I decided to try to make an OS, written 100% in assembly for an ARM development board. I shouldn't say OS though, every time I write an OS, I really only make: memory management, scheduler, mutex, netcard driver, serial port driver and some small application to run on the "os". It's basically just to learn about the architecture of the device. The ARMv7 architecture offers a lot of cool features that I am not using. I just want to keep things simple for now. Once I get something working good, I will go deeper in the documentation and try some more advanced stuff. very easy to peek in memory with qemu's monitor command "pmsave"
no need for a separate bootloader. Can boot kernel directly. I chose to use the "realview-pb-a8" emulated board in qemu. I have never seen that board, I have no idea what it is. It uses a Cortex-A8. So I was able to get a programing guide for that SoC. I started from there. The fact that I am using qemu makes things easier but removes a lot of fun. For example, qemu boots my kernel directly. On a real board, I would need to write a bootloader (or use u-boot). I would need to initialized SDRAM, initialize clocks and "power domains" and other board initialization. QEMU boots your kernel directly into RAM and you can run from there. So I wouldn't quite call this "bare-metal" programming. I guess I could only call this project "kernel programming for a Cortex-A8". A more detailed memory map can be found in the RealView Platform Baseboard for Cortex A8 User Guide. The interrupt vector table must be placed at the begining of the memory. Each entry is 32bits wide. It must be an instruction not an address. So you would typically put a branch instruction to jump to the proper handler. Using qemu, my kernel gets loaded at 0x70010000, so putting the IVT at the begining of my kernel would not work. I had to rellocate the IVT to 0x70000000 once the kernel was running. By the way, on that board the SDRAM starts at 0x70000000 but is mirrored to 0x00000000. Still, qemu starts execution at 0x70010000. but if the IVT is at 0x70000000, the CPU will still see it at 0x00000000 because of the mirror. There are 6 CPU modes in this architecture. Each mode will shadow the register r13 (stack pointer). So they each need their own stack. To set those stacks, you must switch mode and set r13 appropriately. I don't set the User mode stack because this will be done on a per-process basis and System mode uses the same registers as user mode. 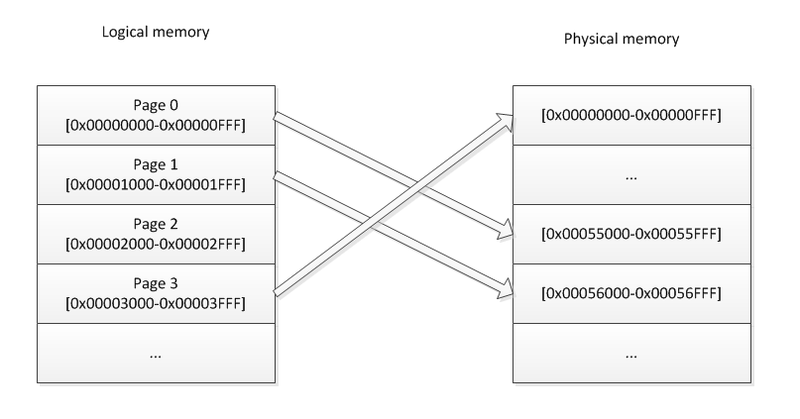 Creating a paged memory system is not difficult. The MMU offers a 2 level page table system The level1 table has 4096 entries, each mapping 1Mb of virtual addresses. You could create "section" entries to map those 1Mb to physical memory directly. You would then get pages of 1Mb and only 1 table that takes 16k in memory. But if you want 4k pages, then those entries need to be "Coarse table" entries, meaning that each entry will reference a subtable (a level2 table). Each level 2 table contain 256 entries, mapping 4k of memory. So for a 4k paging system you would have 1 Level1 table with 4096 entries (a total of 16k in size) and 4096 level2 tables containing 256 entries each for a total of 4Mb in size. The mmu has a concept of domains and access permissions. 16 access domains exist. In a page descriptor, we set the access bits and the domain associated with that page. CP15.register3 contains 2 bits for each domains 0 to 15. These bits determine how page access should be checked. Example: a page is associated to domain 12. CP15.register3 indicates that domain12 is Client. Therefore access permissions in the page will be checked. If domain12 was set to Manager, permissions would have been ignored. The first thing you need to do is setup the page tables like mentionned above. Obviously, you might want to do an identity mapping for the region of code that is currently running the MMU initialization code so that the mapping does not change after having initialized the MMU. Then you need to configure the CP15 register. CP15.reg3 Domain Access control register MCR p15, 0, , c3, c0, 0 where Rd contains the 32bits we want to write. We will use domain 0 for the kernel for now. So bit 1:0 will be set to 0b11 to allow access without checking permissions. all other domains will be set to 0b00 to unconditionally deny access. CP15.reg10 TLB Lockdown Used mark a TLB entry as persistent so it does not get overwritten by other entries. can increase performance for pages such as those containing interrupt handling code so that the translation is always cached. We could probably use a level1 table entry as a Section of 1Mb for the kernel and lock it down in the TLB. To test the multitasking system, I have created some small programs that I build separately and package in the image. The kernel loads the programs in their own process. Ideally, I would have like to create a flash image that contains the kernel at the very begining and then the programs would be appended at the end, kind of like a real hard disk with a bootloader and programs. But I could never get qemu to eumlate a flash file. Even with the "-pflash". The documentation for the board says that when the board is powered on, the flash is mapped at 0x00000000. This will shadow the sdram. To use the sdram,you must remap the flash to some other place. But I could never make that work. I tried creating a flash image and provide it to qemu with the "-pflash" option but that doesn't seem to work. Qemu always wants a kernel file to be provided. I don't know why I can just put my code in a flat binary that would act as flash and get the code running from 0x00000000. The kernel file gets loaded at 0x70010000 which is the sdram. So I am creating a image file containing the kernel and the programs that get loaded in sdram by qemu. When using the SWI instruction, you need to pass it a parameter that would normally be the function number you would want to call. For example: SWI 0x02. Once you are in the SWI handler, you want to get that parameter to know where to dispatch the handler. but the SWI instruction completely ignores the parameter. It is not given to you in any way when you get in your handler. In order to get this, you need to take r14, which contains the return address and substract 4. That would give you the address of the SWI instruction itself. So you can read at that memory area and see what parameter was provided. That is pretty weird in my opinion. I would rather just put the function number in r0 before calling SWI and read r0 once in the handler. That would illimnate an unncessary memory access. Plus, the page at that location will obviously be in the instruction prefetch cache but since we are using "LDM" to load the instruction in a register to read it, it means we will be looking in the data cache. And the page will most probably not be in that cache. So in my project, I will only pass function parameters in a register and ignore the one provided to SWI. Something that confuses me is that when calling SWI, you enter Supervisor mode. Then you are in privileged mode. That makes sense, But then r13 and r14 gets shadowed. I'm not entirely sure why I would want that. It actually complicates things when multi-tasking. I guess that in some more complex OS design, this is very usefull. Assume we have a function called schedule(). This function saves the current context, and reloads the context of the next task to run. In my implementation, this function willa lways be called from the IRQ mode. So the schedule function will be called from a non-user mode. The schedule function will need to store the user-mode context (registers r0 to r14). But from the non-user mode of IRQ, registers r13 and r14 are shadowed. r0-r12 will be the same as the user-mode so we need to find a way to save the r13 and r14 of the user mode. For this, the instruction stm/ldm with "^" can be used to store/load the user-mode registers. this will save/load r0-r12 as usual but the r13 and r14 will be the ones of the user mode. CPSR and SPSR: While in an exception (therefore in a mode different than user or system) the previous cpsr is saved in spsr. Before returning back from the exception, you must reload spsr back into cpsr. This will change the mode automatically, re-enable interrupts etc. To load this and to load r14 in r15 at the same time, look at the notes below about the LDM instruction. LDM instruction format: Compared to AVR32 and x86, this is pretty complicated in my opinion. The "ldm" instruction has 3 forms. The first form does what it says it does. But the second form which is: ldm Rn,registers_without_r15^ (yes, there is a "^" at the end) loads all user mode registers while you are in a non-user mode. so it is a way to load user registers while they are shadowed. The third form, ldm Rn,registers_with_r15^, will automatically load spsr back into cpsr. You could also use a data instruction with the "S" flag and R15 as a destination. For some reason, it will conveniently reload spsr back into cpsr at the same time... Go figure. For example: movs r15,14; will reload r15 and also reload spsr back into cpsr. I am wondering why they re-purposed a flag like this. That is one small thing that makes me like x86 more than ARM. Since I re-enable interrupts after entering SWI, the SVC context must be saved also since a context switch could occur while in a service call (that is actually the whole point of re-enabling interrupts in SWI). So my context-switching code also pushes the r13_svc and r14_svc on the the task's IRQ stack. This is a sample only. My schedule() function does a bit more than that. But it gives you the general idea. When r0-r14 will be restored for the user mode, it would restore the task's context as it was before entering the IRQ to schedule(). r13 and r14 of the user mode will be restored and not the banked ones of the currently executing mode. Note that the TLB must be flushed when reloading the "translation table base register" in CP15 because the cached TLB entries will continue to correspong to the previous mapping. This is a very expensive operation but we can use the concept of ASID by using the CONTEXTIDR register. By setting a unique task ID in CONTEXTIDR, all page translations that gets loaded in the TLB will be tagged with that ID. When doing a lookup, the MMU will ignore entries that do not match the current CONTEXTIDR. So on a context switch, you would change the ID in CONTEXTIDR. This would create duplicate entries in the TLB but with different IDs. So instead of flushing the TLB, entries will be removed only when the TLB is full. See this article for more information about the TLB and ASID. The schedule() function is called by the timer IRQ handler. But you might want to call it from other places. For example, if a task wants to yield, it should be scheduled out immediately. I could do this in a SWI handler but trying to change context from the SVC mode brings up other challenges. So to keep things simple, I want to do context switches only from the IRQ mode. For this, it is possible to use a "software IRQ". This is well documented in the GIC documentation.